This morning we went to Nashville to have lunch with our friends, Angie and Tom Robinson. It was a good day. Kate handled herself quite well. There were a few things that she said that were not true (e.g., she said that we had eaten a Japanese meal that Jan Greeley had fixed.). I had an email from Tom when we returned home that said they thought she had not changed a bit since the last time we were together. Once again this is an illustration of how important long-term memory and strong social skills can be to superficial social interactions. We came home a little earlier than we usually do because I felt she was getting tired and a little withdrawn. This morning before leaving I mentioned something about our not having found the two missing remote controls. She said, “Let’s not worry about it.” I told her I loved her. Then I said, “You know, you are handling your Alzheimer’s well.” She agreed. Then I said, “Let me ask you a question. 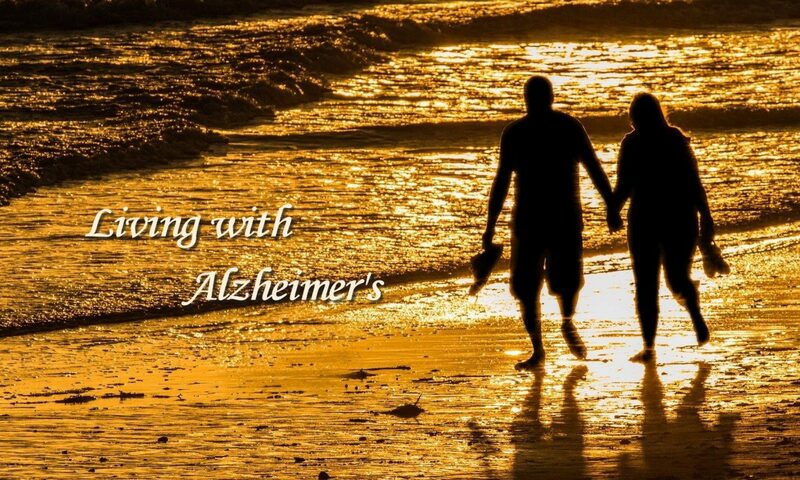 Do you ever associate your misplacing things like the remote controls with Alzheimer’s ?” She said, “No.” I then said, “That’ one of the things that goes along with Alzheimer’s. You put things down in one place but don’t remember where you put them. I hope that should make you feel better about it. You really can’t help it.” This is the first time I have ever pointed out an aspect of her behavior that is connected to Alzheimer’s. I feel sure that she won’t remember our conversation, but it confirmed what I had suspected for some time. She doesn’t associate many of the things she does with her diagnosis. I don’t plan to make a point of it every time he does something like this. In June while we were in Lubbock, I received an email from Cindi Renner, someone we know from church. She is about out daughter’s age. I think that she became acquainted with Kate when Kate was the church librarian. Kate knew lots of church members and their children because the library did so much with children. Cindi said that she had learned about Kate’s Alzheimer’s and that she had recently lost her mother to the disease. She wondered if she might be a friend to Kate. I wrote back quickly saying that she and I would like that. About 10 days ago following our trip to Chautauqua, Cindi had contacted me about getting together. We set that up for this past Friday. I knew that Kate would not remember Cindi; so I didn’t tell her that we were going to meet her at Panera. I thought it would be better if we just bumped into Cindi while we were there. I arranged for us to arrive before Cindi. Instead of one of our regular locations I picked out a booth for 4 so that Cindi could join us when she arrived. Before then Kate moved to another chair where we often sit. Cindi saw me first and came over to say hello. The two of us then went over to Kate. I said, “Kate, you remember Cindi Renner.” She picked that up beautifully as perfectly as if she really did remember. I asked Kate to come back to the table where I was seated. She did so without thinking anything of it. The visit with Cindi was everything and more than I could have expected. Cindi is a warm, friendly person. Kate took to her immediately. We sat there for over an hour and had a beautiful conversation. When Cindi left, Kate told me how much she liked her and, of course, asked me her name again and how we know her. That afternoon I sent Cindi an email telling her how much Kate had enjoyed being with her and that we looked forward to seeing her again. We received a beautiful handwritten note from her yesterday telling us she had enjoyed it and expressed interest in seeing Kate again. This experience underscores what I have already believed. Social contact is a real tonic for her and for me as well. Last night we went to dinner with Mark and Katherine Harrington. We have had lunch with them on several occasions. Kate likes them and also their children who are now grown and living out of state. Mark and Katherine picked us up, and we drove across town to an Italian restaurant they like. It was another good evening. These experiences remind me that it is time for us to get together with Angela and Marvin Gray sometime soon. I also plan to call Phil Grimball to see if we couldn’t get together with him and Jean Roberts for lunch or dinner sometime. His wife died 2 years ago after almost 20 years with AD. He has offered to help me if I need anything. This morning I decided to look for Kate’s pill box. I looked in all the bathrooms. Then I looked in our bathroom once again. I opened the cabinet on her side and slowly looked at one shelf after another. Then I saw it. It was on the second shelf from the top. It wasn’t easy to see because it was turned with the top facing toward the back of the cabinet. In addition, there were other items hiding most of the bottom of the pill box. Why it was there I’ll never know. I am sure Kate would have no idea that she had put it there or why. To me it is clear that she was disturbed by something and did several things last night to hide things and close doors. I am thinking more about not leaving her alone. I may have to figure what is the easiest transition to make. Certainly I can have Libby come at some other time. I am arranged a meeting with Cindi Renner tomorrow morning at Panera. She might be someone who could help as well. Several things to report this evening. First, is we had two problems getting ready to go out. One occurred at lunch. The other this afternoon for dinner. This was a day when I had a luncheon board meeting at the foundation and an executive committee meeting for the music club this evening at 6:30. Here’s what happened. I was scheduled to be at the board meeting at 11:30 or shortly thereafter. I went to the Y early (left at 5:50 a.m.) so that I could get back home before Kate was up. This would also allow me time to make sure she was ready for lunch 10:15. That would enable me to leave around 11:15. Shortly before 10:00, I went outside to tell her it was time to get ready for lunch. I also offered her the opportunity for me to bring home a sandwich if she would like to stay outside a little longer. She didn’t like that and said she would come in. She delayed 15 minutes. I went back out and told her we needed to get ready. She was on the verge of a panic attack. She came in, but she wasn’t ready until 10:55. By that time, she would not have had time to eat at Panera; so I went to get her a sandwich. When I got back I showed her the bag that held the sandwich and put it on the island. When I got home after my meeting, I didn’t see any sign that she had eaten the sandwich. I looked in the trash to see if the bag was there. No sign anywhere. She couldn’t remember that I had left a sandwich but said she must have eaten it if I couldn’t find any sign of it. Since she hadn’t been away from the house, I asked if she would like to go to Panera. She did. When I went to the car, I noticed the Panera bag on a shelf in the garage. She had never unwrapped the sandwich. She had eaten half of the cookie. I took the sandwich with us to Panera where she ate half of it. We came home, and she rested a little and worked on her iPad. A few minutes before 5:00, I went into the bedroom and told her it was time to leave for dinner. I went back to check on her. She had undressed and was getting ready to take a shower. I told her we didn’t have time for that because I had to get to my meeting. She took another 15 minutes to get ready, but she had a panic attack. She was breathing heavily. We went to eat. She didn’t completely calm down until the meal was almost finished. When I got home from my meeting, I found that the door to our bedroom was closed (something that rarely happens). I knocked and then went in. The room was darkened, but it was still light outside. I could see that she was not in the room. I went over to turn on the lamp. It didn’t turn on. I found that she had unplugged the surge protector in which the lamp was plugged. I went to the bathroom door that was also closed. I knocked and opened the door. She was not in the bathroom. Then I went to her room where I found her under the covers as though she were there for the night. I came back to our bedroom. I looked for the TV remote and couldn’t find it. Then I went to her room knowing that it is usually there when it is not in our bedroom. I looked all around her room without success. Not only that, the remote for the TV in her room was not there either. I have looked all around the house without success. I can’t find either remote. I went back to our bathroom to see if Kate had taken her medicine for the night. I didn’t find her pill box. I started looking for it. I haven’t been able to find it anywhere. This is not the first time she has misplaced the pill box. A few months ago, it was missing. I have not found it yet. I’m going to let her medicine pass for this evening. Tomorrow morning I can’t do the same. It has her Venlafaxine. If she doesn’t take that she has a reaction. She can go 24-36 hours without it. After that she has a problem. Fortunately, I have the supply of medicine; so I will be able to see that she doesn’t miss it. I am just curious to see if we find it somewhere. It is amazing how things can get “completely” lost so easily. I can’t help wondering what was going on in her brain that motivated her to put it somewhere else. This is not the first time she has put things in an unusual spot, but it is a striking example of the behavior that is occurring that was not commonplace before. After getting home from a Y breakfast and a stop at Lowe’s for plants, I told Kate to let me know if she would like to go to Panera. She indicated she would. I might not have mentioned Panera, but Libby is at the house. We had left for the breakfast before 8:00, and I knew Kate would want to rest. After 15 minutes, Kate came into the kitchen where I was working on the computer. She was hot. I asked again if she would like to go to Panera. She said she just wanted to get cool. I suggested she turn on the fan in the family room. She went into the family room. In a few minutes, I went through the family room and saw that the fan was not on. She was working on her iPad. I turned he fan on for her. I also told her if she wanted to go to Panera that we would want to go soon because it would be time for lunch in a little while. I went back to the kitchen. In a minute, she was ready to go to Panera. I got things together. As we were turning off of Garners Ferry Road, she said, “Surprise.” I said, “You guessed we were going to Panera?” She nodded affirmatively. It was clear that she hadn’t remembered. It was only when she saw where I was turning that we were going to Panera. We arrived home around 10:00 last night. Although we had had a wonderful time at Chautauqua, it was good to be back in our own quarters again. It is only when you are away from home for a while that you realize how accustomed you have become to all the little things that you like about home. For me, that involves something as insignificant as the soap we use in the shower. Of course, the amount of space we have at home is so much greater than anything we have ever had at Chautauqua. We definitely don’t go there for the lodging even though this year’s apartment was the very best we have ever had there. When we came inside I didn’t pay any attention to Kate. I was focused on getting the luggage inside. When I finished, I noticed that she was walking slowly around the house. I asked, “Are you glad to be home?” She said something like, “What’s going on? Are we going to stay here?” I asked her if she thought something was wrong. She said, “No, I don’t know what I was thinking.” I don’t know either. I have to believe she remembered that this is our home. We had just been talking about going home. All I can say is that she does have periodic moments when she finds things confusing. This was one of them. It was almost midnight before I got into bed. She had been working puzzles on her iPad in bed until about 10 minutes before I joined her. That is much later than we normally get to bed. This morning she was very tired. She got up around 8:30 and ate some yogurt. A short time later she went back to bed. I got her up close to 11:00 for lunch. When we came home, she worked on her iPad for a while. She is now in bed again. I am going to the store soon and will let her sleep. I suspect she will get up before time for dinner and hope that she is able to get to sleep earlier this evening. This is Friday morning. Our last day at Chautauqua. Not the last day for this visit; the last time we will ever make this trip – at least together. If we had left last week, I believe I would have been sadder. The fact that I decided on a third week was a good decision, but it has also given me the feeling that it is time to get back home. I suspect the fact that Kate has been so tired the past few days (Is it almost a week? ), has influenced me. She has only been to the evening entertainment once or twice in the three weeks we have been here. Yesterday she missed the morning lecture. I think it is time for her to be home even though she gets bored there. I believe this is simply a natural step in the evolution of her Alzheimer’s. I will always be glad that we had this much time here.